Claude-Joseph Vernet was famous for his marine views and was the French artist most admired in this sub-genre around the mid-18th century. Vernet first trained with his father, a local painter in Avignon, then continued his studies with Philippe Suavan and later in Aix-en-Provence with Jacques Viali whose output included landscapes and marine views. Sponsored by the Marquis de Caumont, in 1734 Vernet travelled to Rome where he lived for almost twenty years. There he made contact with the French Academy and completed his studies with Adrien Manglard, an artist from Lyon. In addition he studied Claude, Salvator Rosa and Gaspar Dughet, whose works contributed to his choice of specialisation. Vernet achieved his first successes in the 1740s, producing paintings for aristocratic visitors making the Grand Tour, most of whom were French and English. During that period he began to exhibit regularly in the Salon where he first participated in 1746 and was praised by Diderot. 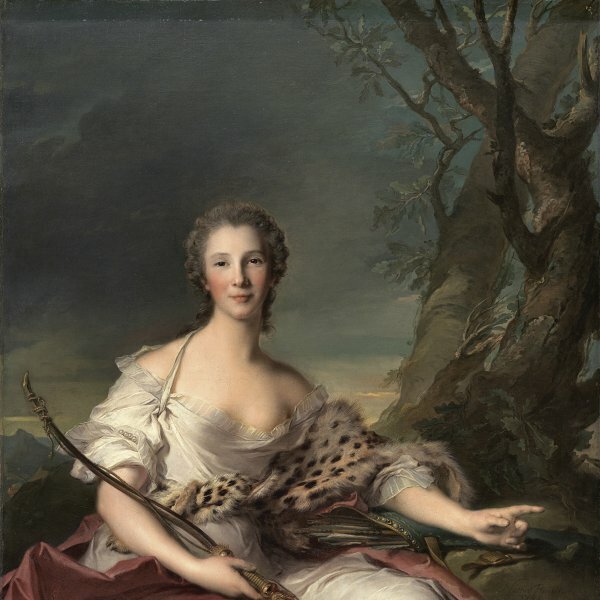 He became a member of the French Academy in Paris in 1753 and sent works to the Salon from Italy, as a result of which his fame extended to his own country. In 1751 the Marquis de Marigny tried to pursuade Vernet to return to France, albeit without success at that date. Vernet’s repertoire included views of picturesque locations, topographical views and imaginary landscapes. It was however, his marine views that were most appreciated and which gained him an international reputation. These views were particularly inspired by the Italian coastline and were constructed with a series of elements that would make them highly prized by collectors of the day. One of Vernet’s specialities was the production of pairs of paintings depicting a calm and a stormy sea, as well as series that depicted the coast at different times of day and under different lighting conditions. Vernet’s coastal paintings reflect his study of the work of Claude Lorraine although in many ways they are considerably less idealised. The present pair of canvases was acquired in 1983 by Baron Hans Heinrich Thyssen-Bornemisza. The two canvases had previously been in a private collection in Argentina from where they entered the London art market in 1978. From the UK they went to a private collection in the US and were purchased by the Baron in New York. Both canvases are signed, dated 1748, and annotated with their place of execution. 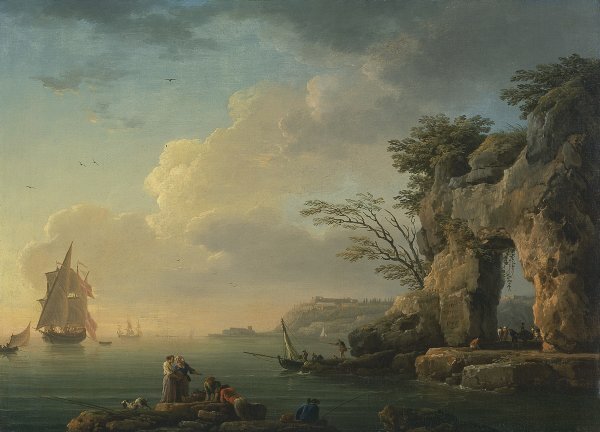 They are examples of Vernet’s most highly appreciated manner, with great emphasis placed on the sky in which the artist offers a careful study of atmospheric effects. In the case of A stormy SeaVernet captures the choppy waves and the wind that whips up the foam and beats down on the fort on the shore on the left. In A calm Sea he carefully recreates the soft misty light of evening that evokes 17th-century classical landscape painting. The two views are completed with figures that are more than mere accessories as they add information to the scene. In the case of A stormy Sea a group on the left struggles to right a boat that has been shipwrecked and overturned on the rocks, while a survivor clings on to the promontory. The drama of the scene increases the overall mood, to which the other canvas provides a complete contrast. In that work, peaceful groups of fishermen engage in their labours at dusk while in the foreground we see two women with their baskets filled with the catch. Vernet’s pleasing chromatic range, outstanding observation of natural effects, smooth brushstroke and overall decorative sense make him one of the most interesting of the 18thcentury landscape painters.